TORONTO, ON – November 14, 2018 – There’s never been a better time to experience what many Canadians already know: The striking Lexus RX series of mid-size SUVs combines brave design, an elegant interior, agile handling, exceptional performance and inspired technology to provide a very modern expression of luxury. That’s because for 2019, Lexus introduces a newly-configured entry point for the self-charging hybrid RX 450h, and has dropped the price on all existing models. New for 2019, the RX 450h Premium edition includes many popular comfort, convenience and luxury features, plus the advanced performance of the self-charging Lexus Hybrid Drive. As well, Lexus in Canada has reduced the starting MSRP on all existing RX models – dropping the MSRP of every 2019 RX 350 by $1,400 and the MSRP on every 2019 RX 450h by $1,600. The RX makes an immediate impression on the street: Every feature on the body is chiseled and sharpened to enhance the RX’s stature, and to project an aura of rock-solid stability. A precisely honed character line runs from front to rear, creating an arrow-like profile, while the flowing roofline minimizes drag, reduces cabin noise, and enhances stability at high speeds. Exterior details of note include a power moon roof, roof-mounted rear spoiler, alloy wheels, power adjustable and heated exterior mirrors with integrated signal lamps, aluminum roof rails, and full LED lighting – including headlamps, high beams, fog lamps, daytime running lights and stop lamp. From chiseled exterior to sublime interior: open the door, and the RX welcomes guests to a realm of sublime comfort and superb craftsmanship, complete with heated and ventilated power adjustable front row seats, perforated leather seating, hand-stitched leather dash, and many elegant cabin trim options. All models feature a media centre built around a Display Audio system with USB inputs, the Auto Sound Levelizer system, integrated Sirius XM Satellite Radio, Bluetooth® connectivity and steering wheel-mounted controls. Drivers will appreciate the many convenience and technology features – from the multi-information display, to the heated steering wheel and leather-wrapped shift knob, to the rain-sensing wipers and headlamp washers. Additional comfort and convenience amenities include dual-zone automatic climate control, power windows with auto up/down function for all windows, the Smart Key System with Push Button Start, power rear door with jam protection, 12v auxiliary power outlets for personal electronics, plenty of thoughtful in-cabin storage and lighting, and more. All models accommodate up to five adults, with a 40/20/40 split second row seat with remote release in the cargo area. Every 2019 RX also delivers the thrill of commanding performance, with a choice of two powertrains. The RX 350 features a 295 HP 3.5L V6, coupled to an 8-speed automatic with sequential shift mode and lock-up torque converter. Meantime, the RX 450h is built around a self-charging Lexus Hybrid Drive. This system uses an Atkinson cycle 3.5L V6 and high torque electric motor to deliver 308 net horsepower through a continuously variable transmission. All gas models feature the Lexus Active Torque all-wheel-drive system, which delivers the traction that only an AWD powertrain can provide, while featuring the ability to distribute torque between the front and rear wheels to maximize fuel efficiency. All models also feature the Drive Mode Select system, with three distinct modes – Normal, Eco, and Sport S – to match the RX to the driver’s mood and the terrain. As a Lexus, the 2019 RX also offers drivers and passengers peace of mind through a comprehensive safety package – starting with Lexus Safety System +. This bundle of active safety technologies (pre-collision system with pedestrian detection, lane departure alert with lane keep assist, dynamic radar cruise control, and automatic high beam system) is now standard equipment on 98% of all new models Lexus offers in Canada. LSS+ supports the driver’s awareness and decision-making under a variety of traffic conditions and contingencies. Other standard safety features include the Blind Spot Monitor with Rear Cross Traffic Alert, whiplash injury-lessening front seats, a backup camera with back guide monitor, 10 airbags, a direct tire pressure monitoring system, anti-theft system and more. There’s even an onboard first-aid kit. The 2019 Lexus RX 350 Navigation Package (starting MSRP: $56,700) adds a voice-activated navigation system with Lexus Remote Touch interface. The 2019 Lexus RX 350 Luxury Package (starting MSRP: $62,950) builds on this, adding an automatic air recirculation control system, clearance and back-up sensors, rear door sun-shade, a 12.3” display, premium LED headlamps and rear combination lamps, wood grain and leather-wrapped steering wheel, premium leather seating, alloy wheels, and more. The 2019 Lexus RX 350 Executive Package (starting MSRP: $68,600) enhances the Luxury Package, adding a 15-speaker Mark Levinson Surround Sound audio system, touch-free power back door, panoramic glass roof, head-up display system, the wide-view front, rear and side monitoring system, power-folding seats, and more. The 2019 Lexus RX 350 F SPORT Series 2 (starting MSRP: $64,050) builds on the base model, adding a voice-activated navigation system with a 12.3” display and Lexus Remote Touch interface, an automatic air recirculation control system, clearance and back-up sensors, Vehicle Dynamics Integrated Management (VDIM), premium LED headlamps and rear combination lamps, a three-spoke F SPORT steering wheel with paddle shifters, LFA-inspired instrument cluster, and more. F SPORT detailing includes the mesh front grille, seats, shift knob, aluminum sport pedals with rubber inserts, scuff plates, 20” alloy wheels, and badges. The 2019 Lexus RX 350 F SPORT Series 3 (starting MSRP: $68,600) enhances the Series 2 model, adding a 15-speaker Mark Levinson Surround Sound audio system, touch-free power back door, Qi Wireless Charging system for personal electronics, panoramic glass roof, the wide-view front, rear and side monitoring system, a power-folding adjustable reclining seats, and more. The 2019 Lexus RX 450h Luxury Package (starting MSRP: $69,550) adds an automatic air recirculation control system, clearance and back-up sensors, rear door sun-shade, premium LED headlamps and rear combination lamps, wood grain and leather-wrapped steering wheel, premium leather seating, illuminated aluminum front scuff plates, 20” alloy wheels, and more. The 2019 Lexus RX 450h Executive Package (starting MSRP: $75,250) enhances the base model, adding a 15-speaker Mark Levinson Surround Sound audio system, touch-free power back door, Qi Wireless Charging system for personal electronics, panoramic glass roof, the wide-view front, rear and side monitoring system, a power adjustable reclining and power folding rear seat, and more. 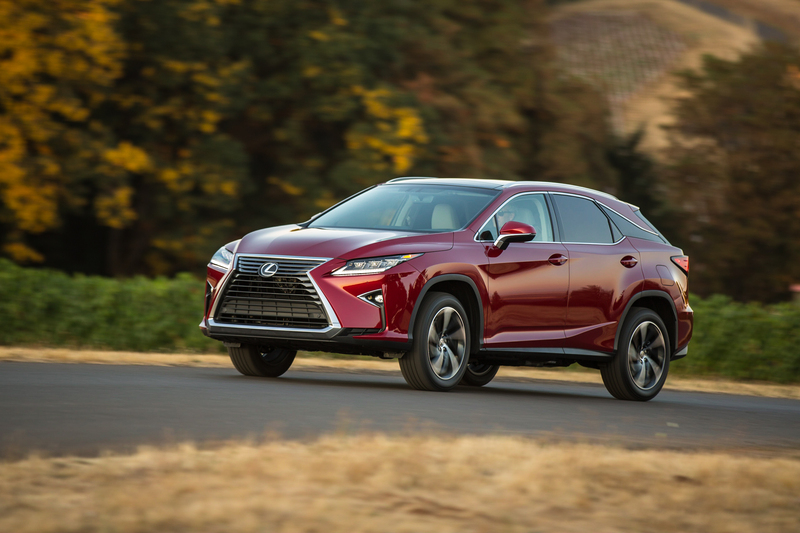 For sportier styling and performance, the base model may also be ordered as the 2019 Lexus RX 450h F SPORT Series 3 (starting MSRP: $75,450). This upgrade adds a 15-speaker Mark Levinson Surround Sound audio system, touch-free power back door, Qi Wireless Charging system for personal electronics, panoramic glass roof, head-up display, the wide-view front, rear and side monitoring system, a power folding rear seat, a three-spoke F SPORT steering wheel with paddle shifters, LFA-inspired instrument cluster, and more. F SPORT detailing includes the mesh front grille, seats, shift knob, aluminum sport pedals with rubber inserts, scuff plates, 20” alloy wheels, and badges.